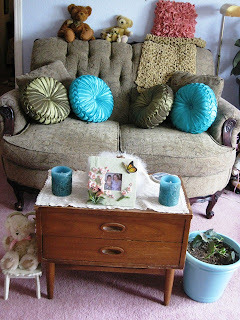 I wanted to share a picture of my loveseat that I just adore. I was able to move it back into my living room after giving my other couches to a friend who had a house fire. I'm so happy to have my sweet little loveseat back where it belongs. See those adorable pillows? I had been wanting some of those for years and years. I remember when I was a little girl, my grandmother had these kind of pillows on her couch and bed. The difference is, she made hers! I can't imagine making these pillows and was so excited when I saw them on sale at Hobby Lobby for half price! 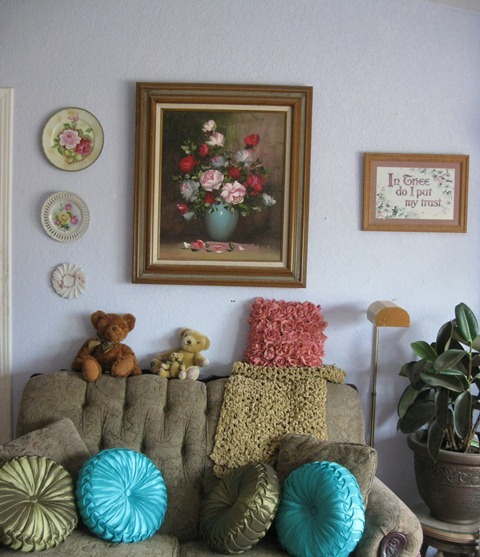 Here's all the beautiful pictures above the loveseat and remember the rubber tree plant? It's grown quite a bit and is so happy in that little corner next to the loveseat. This is one of the many projects that my family helped me with in getting my house back in order. It just makes me so happy!! Another thing my youngest son and hubby did was re-do our ramp that comes into our home. It was really needing it. We got the handrail stained and will be getting the rest of it stained as soon as the weather permits. You have no idea how happy this makes me! I am seriously thinking of doing a Bible study at my house and would like to also have a game night with my friends. I have heard lots of girls are playing Bunco and that just sounds like too much fun. I would like to have little prizes and the whole thing. This is something I've longed to do for years! As soon as I'm physically able, I will be doing these fun things with my friends. Oh, that will be high on my list of blessings!! Beautiful! I have belonged to a Bunco group for over 5 years. It's great fun. Hosting is a bit stressful,but I am always glad to. I hope you can share your lovely home with others very soon. 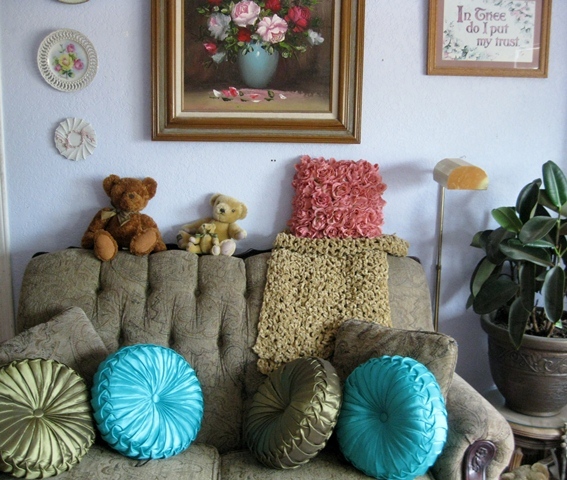 I love the pillows, and teddybears.